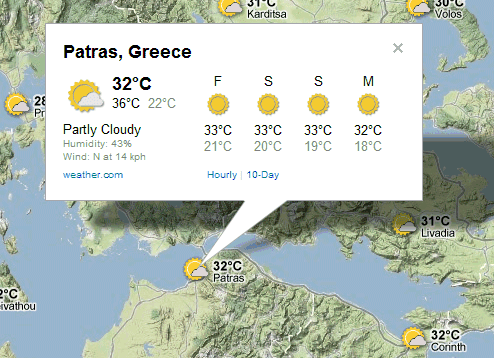 Google Maps added a layer for weather. Just mouse over the satellite box and select "weather" from the list of layers. "When zoomed out, you'll see a map with current weather conditions from U.S. Naval Research Lab. And, if you look closely, you can also tell if it's day or night around the world by sun and moon icons. Enabling the weather layer also gives you an instant weather report for friends and family living around the world," informs Google. Weather reports are powered by weather.com and include information about the current conditions (humidity, wind speed, temperature) and a 4-day forecast. 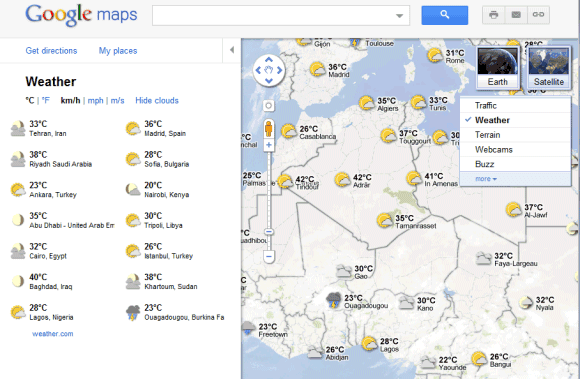 Google Maps is smart enough to display the information in standard units (like degrees Celsius), but if you click on a link that sends you to weather.com, it uses some weird outdated 18th century units that are only used in a couple of backward countries (like degrees Fahrenheit). IMHO a major bug. If it can't be smart enough to autodetect, it should at least default to *standard* units. Google maps are really helpful. I've try using it.